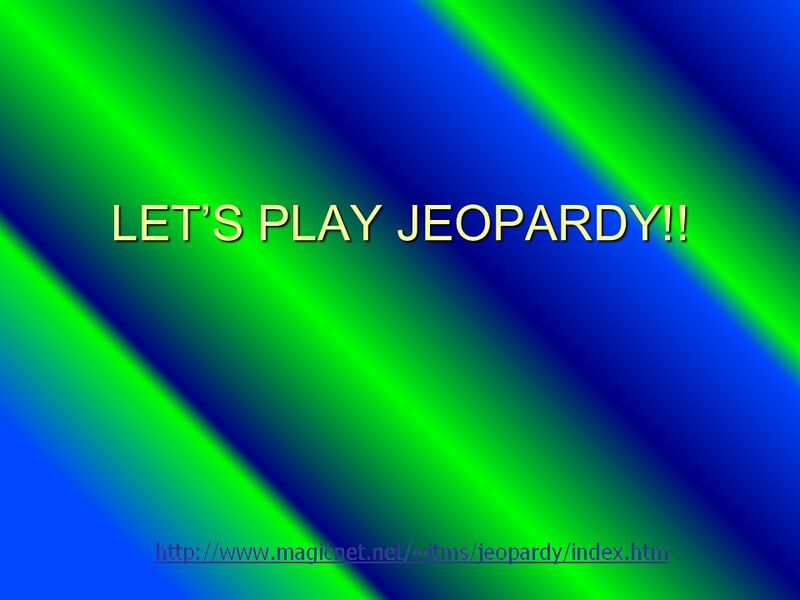 LETS PLAY JEOPARDY!! Dimensional Analysis Matter Scientific Method Measurement Elements, Compounds, and Mixtures Q $100 Q $200 Q $300 Q $400 Q $500 Q. 4 $100 Dimensional Analysis Question What is the conversion factor for 1 Mile in Feet? 5 $100 Dimensional Analysis Answer 5,280 ft. 5,280 ft.
6 $200 Dimensional Analysis Question What is the first step to converting between units? 8 $300 Dimensional Analysis Question What is the Prefix for trillionth? 12 $500 Dimensional Analysis Question Name the prefixes between the base and the billions in order from smallest to largest. 14 $100 Matter Question What are the 3 states of Matter? 16 $200 Matter Question What state of Matter is rigid? 18 $300 Matter Question What is the difference between a property and a change? 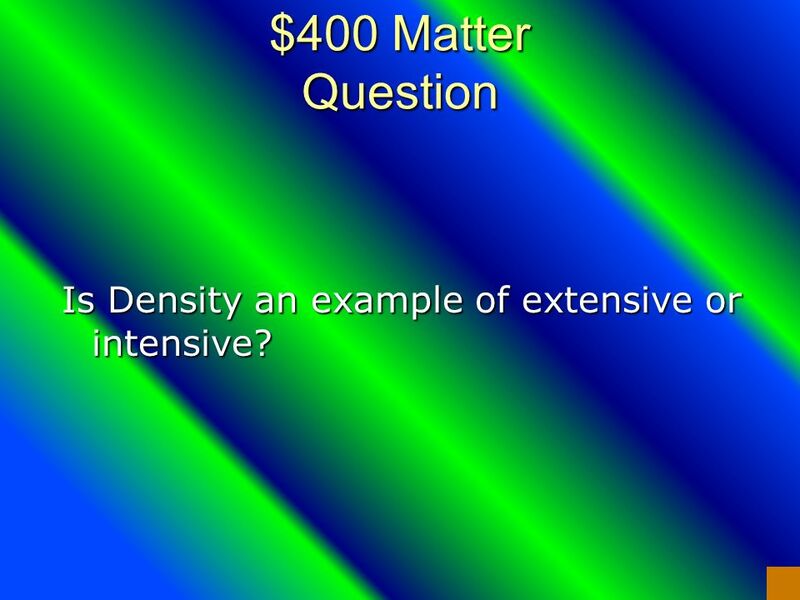 20 $400 Matter Question Is Density an example of extensive or intensive? 22 $500 Matter Question Name 2 Chemical Properties. 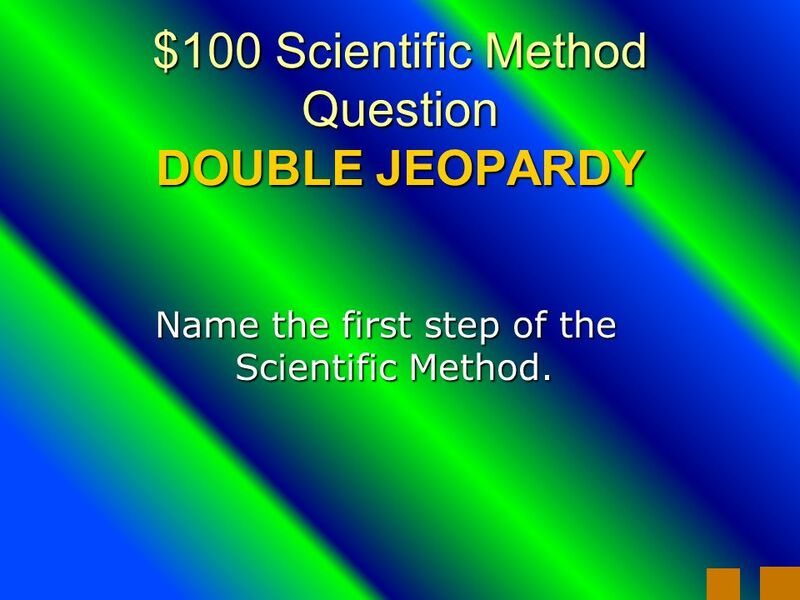 24 $100 Scientific Method Question DOUBLE JEOPARDY Name the first step of the Scientific Method. 26 $200 Scientific Method Question What is the difference between Qualitative and Quantitative? 30 $400 Scientific Method Question What is a Theory? 31 $400 Answer from Category 3 A tested Hypothesis. 32 $500 Scientific Method Question What are the 3 Variables in an Experiment? 34 $100 Measurement Question Measurements used around the world, so results are comparable are called? 36 $200 Measurement Question DOUBLE JEOPARDY A combination of Base Units are called? 38 $300 Measurement Question The Closeness of a Set of Values to Each Other. 40 $400 Measurement Question Convert o Celsius to Kelvin. 42 $500 Measurement Question How do you find pressure? 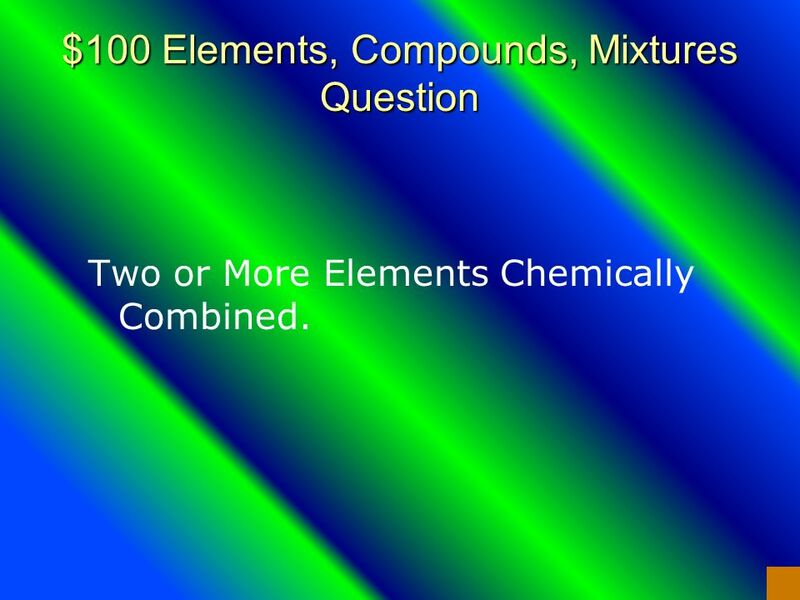 44 $100 Elements, Compounds, Mixtures Question Two or More Elements Chemically Combined. 46 $200 Elements, Compounds, Mixtures Question What are the two Types of Mixtures? 48 $300 Elements, Compounds, Mixtures Question By doing this you separate liquids and solids from each other. 50 $400 Elements, Compounds, Mixtures Question Separates particles by their ability to travel with a solvent. 55 Final Jeopardy Answer Counting, Measured, and Defined. 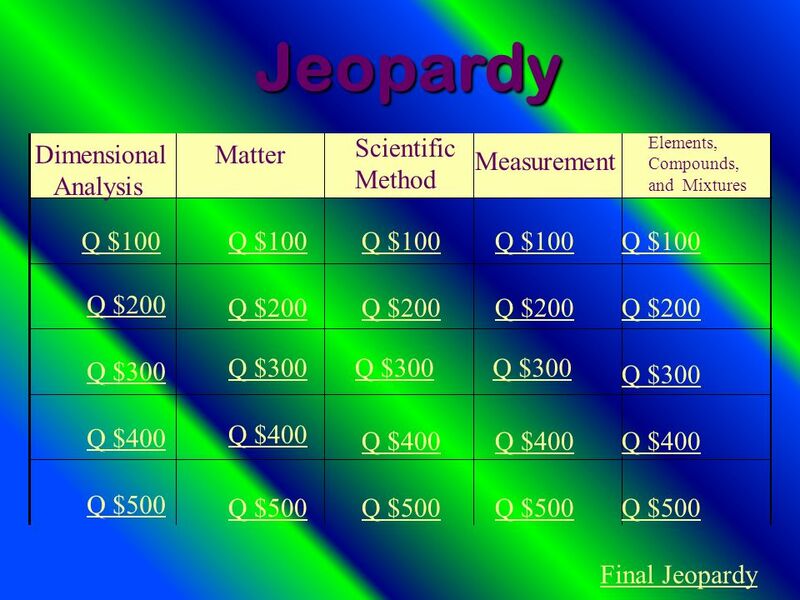 Download ppt "LETS PLAY JEOPARDY!! Dimensional Analysis Matter Scientific Method Measurement Elements, Compounds, and Mixtures Q $100 Q $200 Q $300 Q $400 Q $500 Q." Category 1 Category 2 Category 3 Category 4 Category. Category Category Category Category Category. © Mark E. Damon - All Rights Reserved Questions Final Jeopardy. Category Heading Category Heading Category Heading. Jeopardy start Atoms Compounds Elements Mixtures. 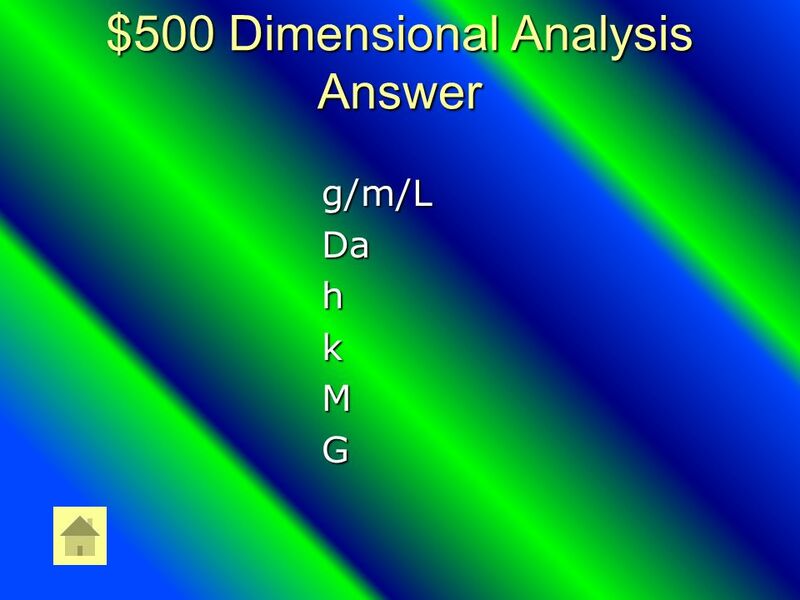 Fundamentals of General, Organic, and Biochemistry Fifth Edition by McMurry, Castellion, and Ballantine. © 2012 Pearson Education, Inc. Chapter 1 Introduction: Matter and Measurement John D. Bookstaver St. Charles Community College Cottleville, MO Lecture. DO NOW Define chemical change. 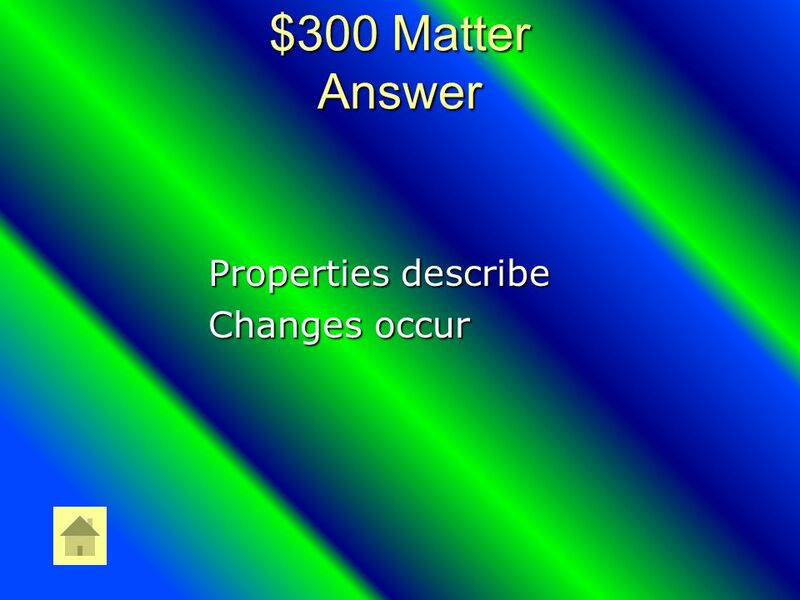 Define physical change. Give me two examples of each. List the 6 physical phase changes. After you are done, take out one.